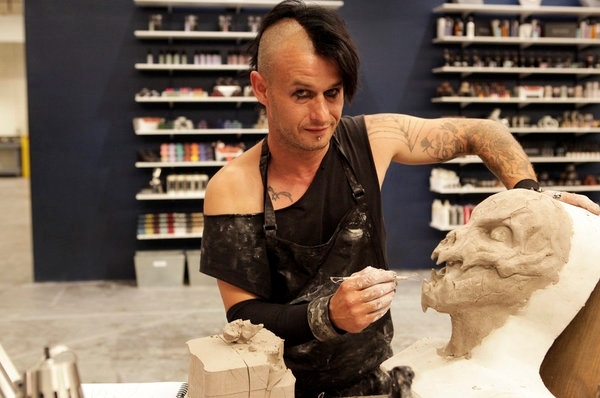 Eric F works on a creature for the SyFy reality competition series "Face Off." Olympic swimmer and apparent babe magnet Ryan Lochte has a new reality show called What Would Ryan Lochte Do? In the first episode, he reminisces about his glory days, makes a half-hearted attempt at dating and steals his brother&apos;s toothbrush. So, he basically does nothing. "Seriously, how are they gonna get enough material?" asked anchor Mike Jerrick after an unintentionally hilarious interview with Lochte on Good Day Philly. As a full first season of WWRLD looms ahead, I ask myself the same question. Over the past twenty years, beginning with The Real World in 1992 and skyrocketing with the U.S. version of Survivor in 2000, reality TV has become a staple of American television. However, the clever concept of filming "real people in real situations" has lost much of its magic since then, with clearly scripted (and often mind-numbingly awful) reality shows like Jersey Shore and My Super Sweet Sixteen depleting brain cells for generations to follow. Why do we enjoy watching ridiculously dumb people make complete fools of themselves? Do we relish tearing apart the Jessica Simpsons, Real Housewives and Honey Boo Boos because mocking them makes us feel better about our own lives? In my opinion, the worst reality TV offenders are Teen Mom (because you have to make it on 16 and Pregnant first), Toddlers & Tiaras (in what universe is dressing your 5-year-old like a street prostitute considered cute and in good taste? ), Keeping Up with the Kardashians (why are these people famous again?) and The Biggest Loser (because losing weight that quickly is horribly unsafe at any size, period). Luckily, not all reality TV shows are hackneyed and irresponsible fodder for the masses. Competition series like Top Chef, Best Ink, Face Off and Project Runway feature contestents who excel in a certain field (for these shows: gourmet cooking, tattoo art, prosthetic makeup and fashion design, respectively) and rely on pure talent in order to succeed. As skilled professionals, they are fascinating to watch, not to mention wholly deserving of the platform they&apos;ve been given. I will admit that the singing and dancing shows can be a bit cheesy at times, but at least the starry-eyed hopefuls on American Idol, The Voice and So You Think You Can Dance showcase talents that extend beyond the realm of petty arguments and party fouls. Other inspiring and thought-provoking examples of reality TV-done right include Undercover Boss, The Amazing Race, Deadliest Catch and my newest favorite, Pit Bulls and Parolees on Animal Planet. I&apos;ll take adorable animal rescues over The Bachelor any day, thank you very much. What are your favorite (and least favorite) reality shows? Leave a comment below, send me a tweet @leahkpickett or join the conversation on Facebook.